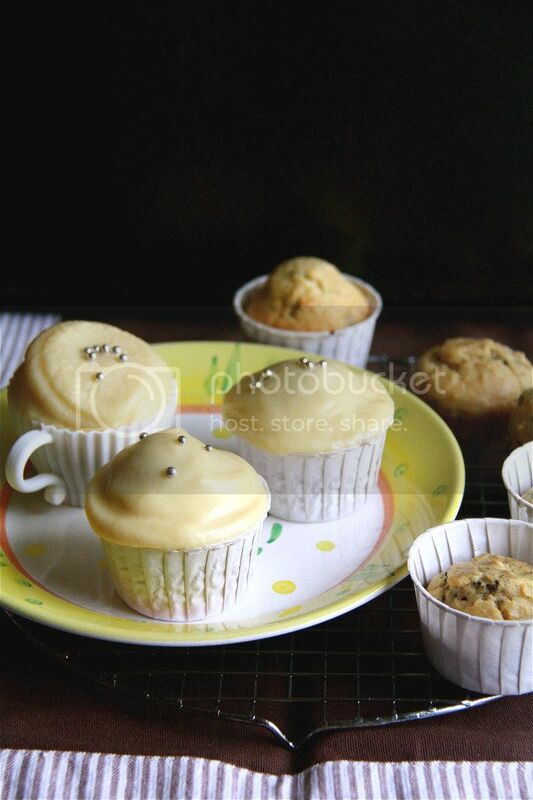 Crumbs and Cookies: tea cupcakes with condensed milk icing. I'm cursed. I swear I am. It took me three tries to get this cupcake right. Plus the day before's one-egg-less mishap with my queen of sheba cake, it's a quadruple whammy. I hope I've used up my year's quota of baking failures, because it sure feels like it. The first try, I did everything right except that I forgot to add in the tea leaves. I mean, it wouldn't be tea cupcakes without tea right? I only realized that something was up after the cupcakes have cooled, and I was debating whether to switch on the oven again to start a new batch. I decided to do that in the end because I could use some leftover ganache I've been meaning to use up to frost the tea-less cupcakes. While making batch number two, I chanted to myself, "Don't forget the tea leaves. Don't forget the tea leaves." Luckily, I didn't miss out on the tea leaves or I would need to send my brain for repair. I mixed up the batter, and noticed that it was much stiffer and thicker than the one from the first batch. It appeared lesser in volume too. I did a quick mental checklist and I was pretty sure that I added everything. 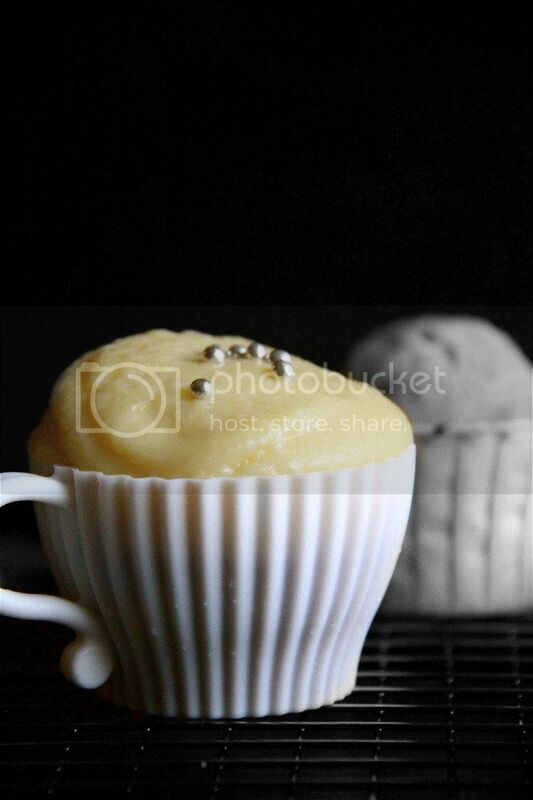 I even made sure I used baking soda instead of cream of tartar, in painful memory of this cupcake I once made. Still puzzled, I portioned out the batter and sent it into the oven. 15 minutes later, the cupcakes were done but they were strangely pale and had bubbles dancing on their surfaces. It was only then I realized that I forgot the sugar! Palm meets forehead. Say what?! The cupcakes still turned out quite soft and tender but obviously, they were on the short side. Hmm... Sugar appears to have a property that affects baked goods that I've not known about yet. I actually tried these sugar-free cupcakes, and evidently still am alive, and I must say that they weren't too bad. They tasted savory because they had no sugar but a bit of salt, and if I'd added cheese or sun-dried tomatoes they could have fooled anyone. But they went into the trash anyway. The final try, thank god because I wasn't going to succumb myself to another round of possible failure, I had my mistake-free cupcakes. And they were well worth the effort too. They were fluffy in the feathery kind of way and were moist with a nice buttery flavour. The tea flavour was also prominent and I was happy for it because I didn't steep the tea leaves in liquid but just mixed them into the batter as they were. I've just saved myself a lot of trouble knowing that I can sufficiently introduce a strong tea flavour without so much fuss. I just didn't like that the strands of tea leaves were too big and became a little chewy in the cupcake. I would grind the tea leaves down the next time I try to incorporate them into a batter. I would love to try this cupcake recipe plain and see how they fare because I think I'm on to a really good vanilla cake recipe here! The condensed milk icing was a bit of flop. I imagined that it would be stiff enough to pipe but it quite apparently isn't. I was going for Sweetapolita's cupcake look and failed miserably. I guess that's why it's called icing and not frosting. But I love this frosting to bits! If there is proof that condensed milk and butter go hand in hand, this is the one. I shamelessly licked up all the leftover dribbles of icing in my teacup mold after the cupcake was devoured with much enthusiasm, and I would make another batch of icing just to do it all over again. Make. This. Icing. You won't regret it. Measurements here are strange as they are a third of the original recipe from Scientifically Sweet. In the original recipe, the total yield was supposed to be 15 but I found that that would be stretching the batter a bit thinly so 12 would be a safer bet, and when divided by three, 4. I also reduced the sugar by a quarter. Preheat oven to 350F. 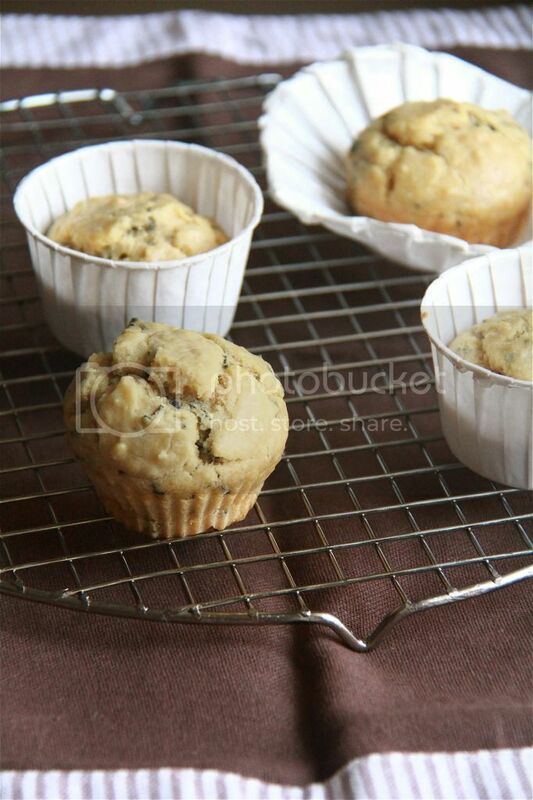 Line 4 muffin holes with paper liners. Mix the egg yolk, sour cream, oil and vanilla extract together until uniform. Set aside. Sift the flours, baking powder and baking soda and salt together into the bowl of your mixer. Add the ground tea leaves and sugar and mix until incorporated. Beat in the butter until the mixture becomes sandy. Add the egg mixture and beat on low speed until a batter forms. Gradually add the milk and beat to incorporate. Be sure to scrape down the sides and not to overmix. The batter will be smooth and satiny. Portion out the batter into the liners and bake for about 15 minutes or until a skewer inserted into the center of the cupcake comes out mostly clean. Cool the cupcakes completely before icing. Beat the butter until it's smooth and creamy. Add the condensed milk and beat until combined. Beat in the icing sugar and salt until incorporated. Use immediately or chill it for a thicker consistency before using. 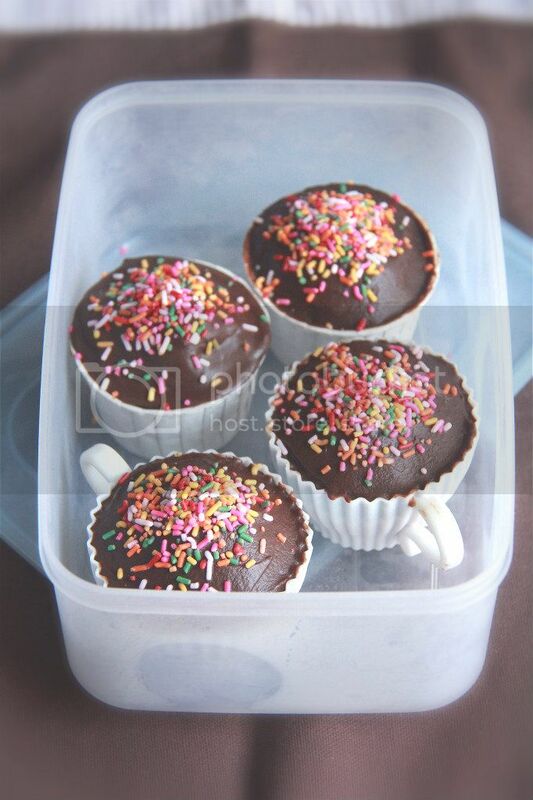 They look great :) What else do you think the icing would taste good on? What kind of tea leaves do you use?